Aurora Officers Craig Hess (left) and Robert Little. In Aurora, Colorado recently 86-year-old Julia Brecht did her shopping. When the 86-year-old was looking the other way a thief snatched her purse out of the shopping cart and ran off. Brecht lost all her money, credit cards, and even her house keys. She was worrying how he would take care of her husband, who is confined to a wheel chair. 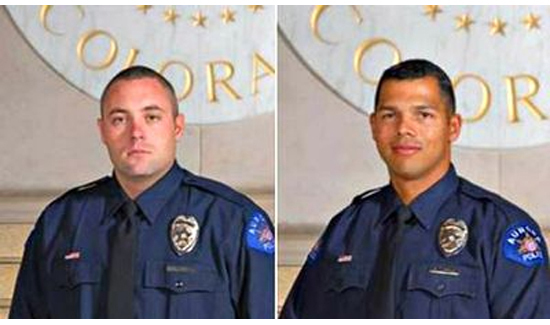 Then came along Aurora, Colorado police officers Craig Hess, and Robert Little. First things first. The officers took the report from Julia and witnesses. Then they called and cancelled her now stolen credit cards. Then they bought her groceries and turned a nightmare into the kind of feel-good story everyone can appreciate.